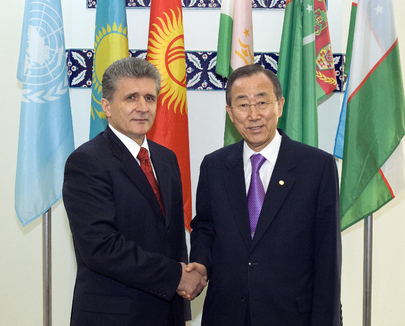 UNITED NATIONS, January 13 -- After attacks on ethnic Uzbek communities in Kyrgyzstan last year, what has the UN done? This month's Security Council president Ivan Barbalic of Bosnia painted a positive picture in a press statement he read out on January 13. Inner City Press asked him if UN envoy Miroslav Jenca, in his closed door briefing, had mentioned continued charges of torture in Kyrgyzstan. Video here, from Minute 2. “No, I am going to UN Radio,” Jenca said. Inner City Press repeated Barbalic's statement, and asked about Kyrgyz torture. “We are looking closely,” Jenca said, “attracting attention to the problems in the south.” Some would that a UN envoy who is seeking to attract attention to human rights problems would probably speak on camera at the stakeout. Kyrgyzstan is run by a former UN staff member, Rosa Otunbayeva. Recently the Kyrgyz official inquiry into the clashes that pushed Uzbeks out of Kyrgyzstan blamed the incidents on the Uzbeks themselves. Inner City Press asked Jenca whether the UN took part in what's called the international inquiry headed by Finnish MP Kimmo Kiljunen. The UN Spokesperson's Office never answered Inner City Press repeated questions about what role, if any, the UN would play, just as it did not answer Inner City Press' questions of January 13 and before about Ban Ki-moon's Panel on Sri Lanka, whether it will in fact travel to that country and make any public report. “We maintain close contact,” Jenca said, “we provide technical assistance.” He said the work “on the ground” will be finished by the end of January, and a report out in February or March. We'll be waiting. Inner City Press also asked about the water wars between Uzbekistan and Tajikistan, an issue on which it is not clear if the UN Regional Office is doing anything. Jenca responded by referring, as before, to an different water issue, an organization to Save the Aral Sea. “You've spoken with the Tajiks and Uzbeks, you know how it is,” Jenca said. “We need to keep impartiality.” He mentioned the dam at issue, and an World Bank risk assessment. “Both sides are looking at us,” Jenca said. “We cannot just be there and do nothing.” We'll see. UNITED NATIONS, August 5, updated -- The UN's and its Security Council's temporary interest in the ethnic cleansing of Uzbeks in southern Kyrgyzstan appears to have dissipated. The UN's Central Asia envoy Miroslav Jenca, only behind closed doors, is briefing the Council this morning. A boilerplate Press Statement, little different than the one issued like clockwork every six months, has been circulated, as if nothing happened in Osh and Jalalabad. Never again? Some Council members are pushing back, trying to get more substance into the Press Statement. One which held the Council Presidency during some of the violence is particularly interested. But not only this month's Russian presidency, but also the U.S., which has appeared publicly to call for accountability, seem to prefer not using the UN on this issue, leaving the Council's statement vague and “decaffeinated,” as one non Permanent member put it. This appears to include France, whose minister called the pogrom a crime against humanity. A French diplomat leaving the Council at 10:45 am predicted the Press Statement will be adopted "as is." What about follow through on the crime against humanity? There was already a statement about that, back when it happened, he answered. But what about follow through? And what about such non P-5 speakers on human rights as Austria? Even with the Permanent Representative away, the positions should not change. One of the questions is what role the UN will play in investigations into the causes of the pogrom. Inner City Press has been asking about this for weeks. Inner City Press: On Kyrgyzstan, the OSCE [Organization for Security and Cooperation in Europe] Parliamentary Assembly Special Representative, Kimo Kiljunen, he said there’s going to be an investigation conducted by his organ… by a commission, international commission, of the violence in southern Kyrgyzstan. And he also said that the United Nations would be involved in the commission. So, I wanted to know, is that the case? What will be the United Nations role in an international investigation of the causes of violence in southern Kyrgyzstan? Spokesperson Martin Nesirky: Let me find out. Just a general point, the OSCE Parliamentary Assembly is not the same thing as the OSCE itself, as I’m sure you understand. So we would need to see precisely what the composition, the intended composition, would be. But the other more general point is that we’ve said already that there should be an independent investigation into the events that took place in Osh and Jalalabad and in the south of Kyrgyzstan. So let me get back to you on that, okay? Inner City Press: you’d said you would find out, and I wanted to ask whether you have. One is, what is the UN’s role in any possible investigation into the causes of violence in southern Kyrgyzstan? On August 3, Inner City Press asked incoming Council president Vitaly Churkin if the August 5 consultations would include a discussion of UN involvement in an investigation, and if Russia believes that Council blessing would be required for the UN Secretariat to do that, as Russia as argued in the case of Sri Lanka war crimes. Let's see, Churkin answered. Yes, let's see. Watch this site. Update of 11:09 am -- the US, it seems, is happy with the boilerplate, saying it will "support Jenca" who has "worked hard." Even the main proponent of caffeinating the Press Statement with more substance about human rights and accountability for the Kyrgyz pogrom appears to have given up. They raised it, the P-5 shrugged, they left. If it was an egg attack on P-5 peacekeepers, though, the Council would act. And so it goes.